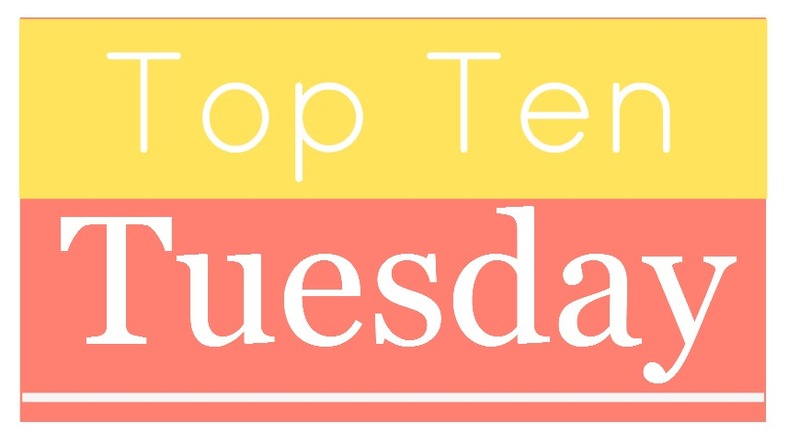 We are doing The Broke and the Bookish's Top Ten Tuesday again this week. 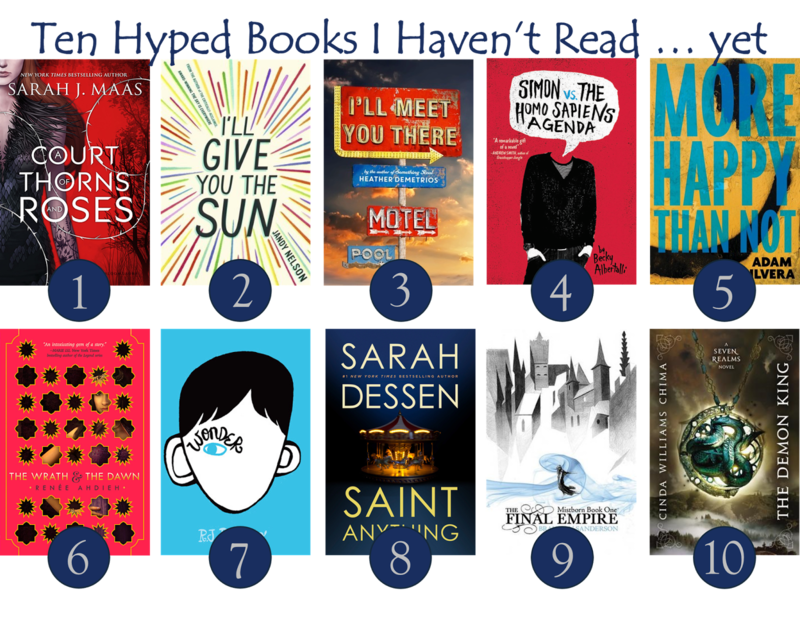 Today's topic is Ten Hyped Books I Haven't Read. I have heard so many good things about all of these books. And, while some are higher priorities than others, I have nothing against reading any of them. A Court of Thorns and Roses by Sarah J. Maas: Doesn't it seem like everyone has been raving about this book? Confession: I'm a little late to the Sarah J. Maas party. I didn't read Throne of Glass until this year. I'm now on Heir of Fire and enjoying it pretty well, but I'm not sure I'll ever be a Maas superfan. However, I see myself reading this one in the future because I have a Beauty and the Beast post in the works. I'll Give You the Sun by Jandy Nelson: This one got the Printz award last year, and if that's not hype I don't know what is. Also, lots of trusted friends loved this one. I hope I get a chance to read it someday. I'll Meet You There by Heather Demetrios: It seems like everyone loves this one. They liked Exquisite Captive a lot too. I haven't read that one either, but I am definitely open to reading something by Heather Demetrios. Simon vs. the Homo Sapiens Agenda by Becky Albertalli: This one just might be the YA debut of the year, and I haven't read it. More Happy Than Not by Adam Silvera: Another highly hyped debut, Adam was even on Epic Reads' Tea Time. I tried so hard to get an advanced copy of this book and failed at every venture. So, I'm waiting to get it from the library, and the processing is taking forever. The Wrath & the Dawn by Renee Ahdieh: I was going to let this highly hyped retelling of 1001 Arabian Nights pass me by, but I've seen so many absolutely glowing reviews that I don't know that I can do that anymore. Wonder by R.J. Palacio: I feel like the only person who hasn't read this book. My book club discussed it on a day that I was out of town, so I just didn't read it, and I probably should have. Saint Anything by Sarah Dessen: I included Saint Anything on this list because it's Sarah Dessen's newest book, and I've been seeing it everywhere, but (confession time) I could have put any of her books on this list because I have read none of them. Yeah. 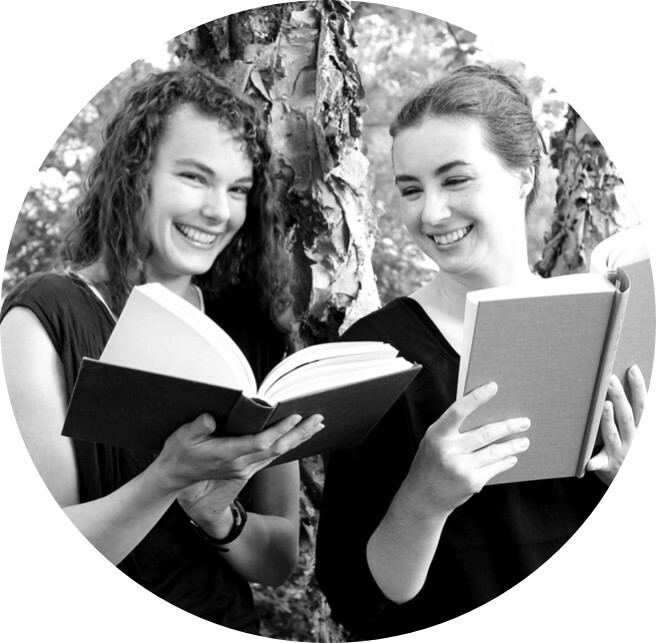 And this is a YA book blog. Mistborn by Brandon Sanderson: There is a group of Brandon Sanderson lovers in my book club, and they talk about Brandon Sanderson every time we get together. The only reason I've read anything by Sanderson is because one of them chose Warbreaker for her book club pick. The Demon King by Cinda Williams Chima: I've been meaning to read Chima's Seven Realm's Series for years. Years. All my friends love these books. Which of these books should I move to the top of my TBR pile? If you enjoy fantasy at all, I completely second all recommendations for both Mistborn and Seven Realms. Both are very, very good (in different ways). I also love Wonder, but that's in a completely different vein. It only took a couple of hours to breeze through, though. I haven't read any of the books on your list, but I do have a few of them on my shelf.